Pedals is concerned by the disappearance of secure cycle parking facilities from plans for the New Central Library and Bus Station development on the site of the old Broadmarsh Car Park. Original plans contained a secure cycle parking hub but this has been removed! Council policy states that a car parking development of this size must provide a minimum of 120 cycle stands – we want to make sure this is a condition of granting planning permission. Council policy states that they will pursue the development of secure bicycle parking facilities at public transport interchanges and bus stations. We want it to be convenient and hassle-free to go to the library by bike. URGENT! Click here to take action now. 1. The revised plans do not contain details of any cycle parking. They do not meet Nottingham City Council’s minimum standards for cycle parking as set out in the Local Plan which require a development providing 1208 car parking spaces to provide a minimum of 120 cycle stands. 2. The New Central Library, Bus Station and Car Park will be a transport interchange and should provide secure cycle parking facilities. 3. 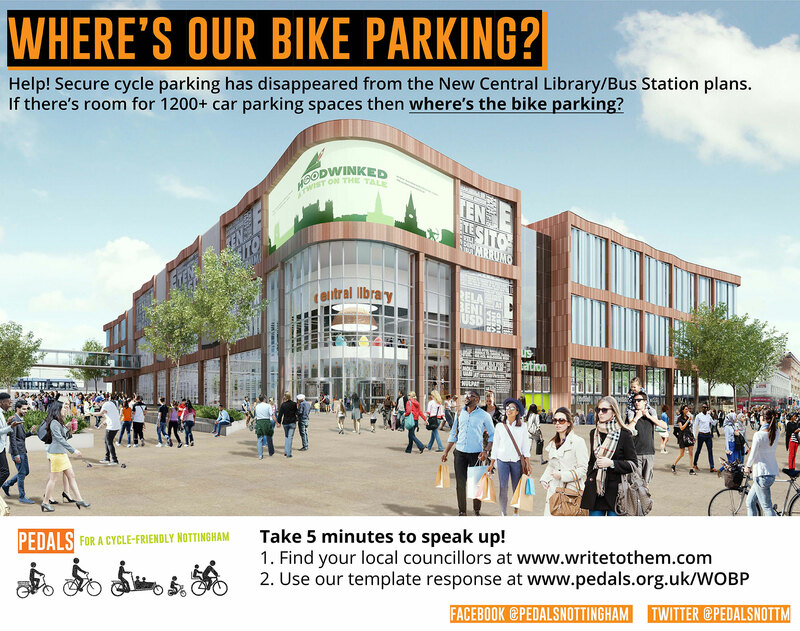 The overall increase in car parking spaces (29 more than the demolished Broadmarsh car park) and lack of cycle parking does not ensure that public transport users, walkers and cyclists will receive priority over car drivers. 4. The Old Broadmarsh Bus Station and Car Park (now demolished) contained a secure cycle parking facility with lockers. The loss of this facility without replacement and improvement would represent an unacceptable loss of secure cycle parking facilities in a key city centre area. You can read a short summary of background information to the planning application here.